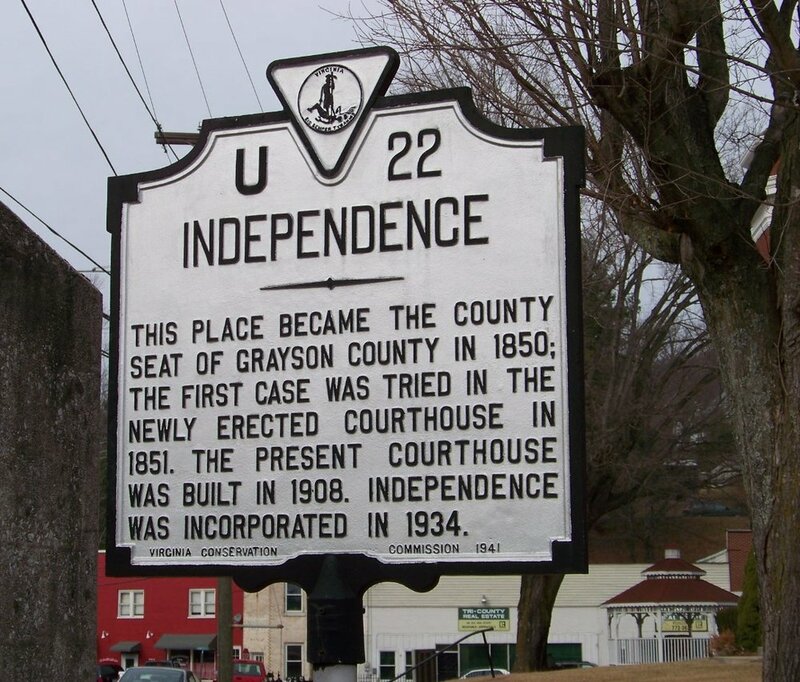 The Town of Independence came into being in 1850 as the settlement of a dispute about where to locate the county seat. At that time, a controversy arose between the people of Old Town and people of the Elk Creek area. Each group wanted the County seat in its area. The final decision, made by three commissioners from adjacent counties, was to locate on the site favored by a group of "independents" and to call the town Independence. These commissioners hiked to the top of Point Lookout Mountain and looked down into a grove of trees where 5 streams met and decided that would be the site for the new county seat. Nearest city with pop. 50,000+: Winston-Salem, NC (71 miles). Nearest city with pop. 200,000+: Greensboro, NC (99 miles). Nearest towns: Sparta, NC (8 miles), Fries, VA (14 miles), Galax, VA (16 miles), Rural Retreat, VA (21 miles), Wytheville, VA (23 miles), Atkins, VA (25 miles). Wythe-Grayson Regional Library: Location: 147 S. Independence Ave.